I’m not saying that, but our Bread Bakers Group member Cindy suggested that we all go nuts in the month of June. Ok please don’t get us all wrong… didn’t mean we all go cuckoo or bonkers. Cindy who blogs at Cindy’s Recipes and Writings, has a beautiful and interesting blog. She suggested that we use nuts either as flour, meal, chopped or with nut butters. I decided to make a carrot bread which I had been wanting to do for a long time. Living in a third world country does not allow me to buy nut flours or meals easily… they cost the earth. Nuts are expensive in this part of the world but I get my constant supply from either India, Canada or UK whenever I travel. Luckily, I’m not much into clothes, shoes and bags so my suitcase is usually filled with things all related to the kitchen! I added fresh grated coconut along with a generous amount of nuts. Did you know that coconut is considered a fruit, nut and a seed? And that’s what the coast of Kenya has plenty of —coconuts. The coconut, carrot and nuts makes this bread quite dense. Grease and dust or line a 9″X 5″ loaf tin. Grease it using butter. Keep a piece of aluminium foil ready that can be covered over the top of the loaf tin. Sift the flours, baking powder, baking soda, salt and cinnamon into a bowl. Add the coconut, grated carrots, nuts and mix well. In another bowl add oil, sugar, eggs, vanilla extract and carrot puree. Whisk it till its all mixed. Add flour to the wet ingredients and mix till the flour is just wet. Don’t over mix. Bake for 60-70 minutes. After 20 minutes check to see that the top is not browning too quickly. If it does then cover the top with the aluminium foil-tent it. After 60 minutes, check if the bread is done by inserting a toothpick or a knife into the middle of the loaf. If it comes out clean then the bread is done. Let the bread cool in the pan/tin for 15 minutes. After 15 minutes remove it from the tin and let it cool on a wire rack. Slice and serve with butter, jam or marmalade. You may use plain flour instead of wheat flour. Don’t be in a hurry to remove it from the pan/tin. Almond Butter Chocolate Chip Muffins by Pavani at Cook’s Hideout. 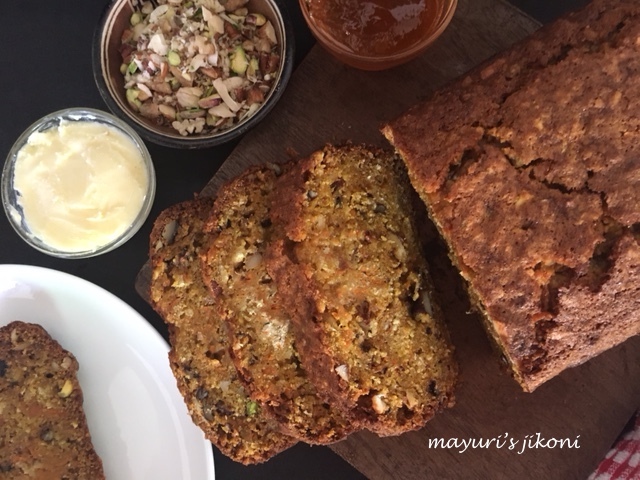 Fig Date Walnut Bread by Sneha at Sneha’s Recipe. Thanks for going nuts with us! Your bread looks so moist and tender! Wow Mayuri, that looks like a delicious bread. Love the addition of coconut in there — yummy!! I'm like you. I usually shop more for kitchen related stuff rather than clothes!! Love this bread!! What a great bread, Mayuri! It's full of all the good stuff! This bread looks and sounds absolutely delicious. Love the combination of carrot and nut. A healthy, delicious bread. Carrot bread are my favorite , with the crunch from the nuts wonderful….. Many tanks for supplying this information. again here frequently. I'm quite certain I will learn plenty of new stuff right here!